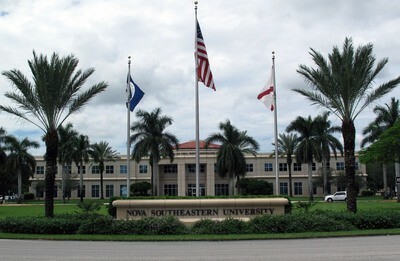 FORT LAUDERDALE/DAVIE, Fla. – Every 10 years, the Southern Association of Colleges and Schools Commission on Colleges (SACSCOC) – the accrediting body that governs Nova Southeastern University (NSU) – performs an exhaustive review of the university in preparation for re-affirmation. In April, 2017, a team of nine reviewers visited NSU’s Fort Lauderdale/Davie campus for three days. After the April visit, the team reported “no findings,” and the on-site committee is recommending full reaffirmation of accreditation to the SACSCOC Board of Trustees at their December 2017 meeting. “I am as proud of NSU today as I have ever been, and on behalf of the Board of Trustees, I commend all those who were involved in making this process successful,” said NSU President Dr. George Hanbury. The visit to Fort Lauderdale was on the heels of visits to NSU’s campuses in Puerto Rico, Jacksonville, Tampa, Orlando, Miami/Kendall, and Palm Beach, as well as a site in the Dominican Republic. SACSCOC reviewers met with students, faculty, administrators, and members of NSU’s Board of Trustees. Some of the comments from the Chair of the committee included remarks about the exemplary hospitality of the NSU community, the quality of the academic programs evident from the documentation provided, the commitment and excitement at all levels and across all locations for the QEP, and that NSU has clearly committed to quality on all levels since its last reaffirmation. As part of the reaffirmation process, NSU submitted a Compliance Certification, a report totaling over 1,000 pages. The Compliance Certification covered 95+ SACSCOC Principles of Accreditation, demonstrating NSU’s compliance. Also, NSU developed a comprehensive Quality Enhancement Plan (QEP), which is an integral component of the process. Developing a QEP is an opportunity and an impetus for an institution to enhance overall institutional quality and effectiveness by focusing on an issue or issues the institution considers important to improving student learning. NSU’s QEP committee recommended that the university focus the QEP on enhancing student writing through the creation of a unified writing center that offers writing assistance to students at all learning levels, in all delivery formats, and provides faculty members with support for teaching writing in the disciplines. The name of the QEP, Write from the Start, along with its logo, was the result of a student competition that garnered more than 300 entries, and was selected by peers. The QEP Proposal Team researched best practices in the fields of writing, rhetoric and composition, and writing centers and determined five student learning outcomes that address student writing at all levels. In order to achieve the student learning outcomes, the QEP Committee developed strategies that focus specifically on student learning, as well as faculty development. All writers need multiple levels of support. For students, this support begins in the classroom with faculty members who have been trained to teach writing in the disciplines. The university will offer a variety of writing support programs to students and faculty members through a centralized NSU Write from the Start Writing and Communication Center. Each of these strategies, along with faculty resources, focuses on helping students become better writers who understand and work carefully through the writing process. Be sure to sign up for NSU’s RSS feed so you don’t miss any of our news releases, guest editorials and other announcements. Please sign up HERE.